A good definition of learner autonomy is that of Henri Holec, who categorised it as the ability to take charge of their own learning and to be responsible for decisions about their learning (Smith, 2008; Borg & Al-Busaidi 2012). This means that learners get to choose what the objectives of their learning are, what the content of their learning is and in what order they will learn it, which methods and techniques are to be used, and they get to evaluate what they’ve learned. The problem with this in an exam context is that many of these decisions are taken out of our hands: the exam becomes the objective, determines the content and is the evaluation. The choices left to learner and teacher seem to become simply those of sequence and technique. This though, does not need to be the case. Wall & Horak, in their review of the impact of changes to the TOEFL test on teaching and learning, quote a teacher as saying “The test is the curriculum” and while this may be true in some respects, many exam providers put considerable time and effort into ensuring that their tests have “positive washback” and that they are beneficial to the learning process. An example of this might be in a Cambridge English: First (FCE) listening paper; part two asks learners to complete a set of notes and the skills developed in learning to successfully complete this part of the exam should be transferrable to other contexts. Recognising aspects of the exam which offer such opportunities gives us a lot more flexibility to work with the learners to help them develop in their own way. Thus while the exam may determine the focus, it does not have to determine the content. An alternative to doing Cambridge English: First (FCE) listening part two exam practice, and at the same time giving learners the opportunity to go their own way, is to use TED talks. Learners can choose the talk they want to, that is of interest to them, listen to it and make notes. They then step away from the computer and use their notes to report back to their group on what they heard, what they thought about it and what the implications are. Other learners can be encouraged to ask follow up questions. An alternative would be for learners to report back to their group using another student’s notes – which raises an interesting and useful debate over how to produce effective notes and the different techniques involved. Equally, while the exam may determine the overall objectives for the group, learners come into the classroom with different learning backgrounds, different strengths and weaknesses and different attitudes towards English, the learning process and the exam. For some, all three are imposed upon them by parents and for others all three are a passport to a better future. There are two tools that the teacher has here that can help with this – needs analysis and diagnostic testing. Using needs analysis tools may seem unnecessary with an exam class as their needs are fairly apparent, however this it can be of great help in determining a course sequence and lesson focus. Learners have an instinctive grasp of where they feel weaker or what they need to practise more, very often though they think in more general terms of needing to improve “speaking” or “grammar” and this needs to be guided into more specific areas such as “talking for two minutes with a prompt card” (IELTS Part Two) or “Reported Speech”. This is where an effective needs analysis questionnaire can be useful. While needs analysis reveals what learners need or want, it doesn’t always show what learners lack, particularly in vocabulary and grammar development. Here, we can use diagnostic testing to help. One of the joys of exam classes is that the diagnostic testing is simple and straightforward, we can just administer a practice exam with the students and analyse the results to see where the strengths and weaknesses lie. However, depending on the exam, this may not reveal specific areas of vocabulary and grammar to focus on and here we can turn to grammar practice books, many of which have a diagnostic test at the beginning, to figure out what to focus on. With all this information, the teacher and learner can develop a personalised learning plan so that the learner can go off on their own, to address their specific needs, in their own time and at their own pace. While the exam provides a final or summative assessment of the learner, it is not a very useful tool for ongoing evaluation of lessons, learning or progress, as perpetually working through a three hour exam is (a) time consuming, (b) boring and (c) soon leads to a lack of exam practice materials! An alternative then is to ask students to complete a regular feedback form that highlights their thinking about the lessons and their learning. How do you think the course is going so far? What do you like about the lessons? What don’t you like about the lessons? What would you like to do more of in our lessons? What would you like to do less of in our lessons? a) Would you like to do a lesson like this again? Why / Why not? b) How do you think you improved your English today? c) Do you think you need to do more work in this area? d) What do you think was most useful in today’s lesson? e) What would you like to focus on in the next lesson? How much time in class did you do your best? How much time did you spend outside of class each week studying English (online English-learning sites, reading a book, etc.)? Of the time you spent studying English outside of class, what did you spend the most time on? These questions are important to include because they bring the focus of the learning back to being the responsibility of the learner, and again, while the questions might need tweaking depending on context, level and exam, they show the importance of autonomy and guided self-study. How regularly you use feedback questionnaires is obviously a matter of personal circumstance. A colleague once required their students to provide feedback at the end of every lesson, until the quality of feedback deteriorated beyond usefulness. There is also the belief with some students that the teacher is the expert and is expected to know what is needed and what to teach – it is important to phrase the questions so that they reflect more on the learning than the teaching in these cases. Overall though, the goal is to move the course away from a linear, coursebook led process and more towards a cyclical, learner led process. In this diagram, we have used our diagnostic testing and needs analysis to draw up an initial course plan, which has led us to plan our lesson and teach the class. Feedback from the learners then helps us to reflect on the lesson and whether aspects of it need revisiting, or whether content in the lesson has led us to something else that needs work. 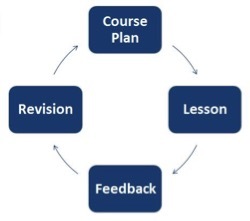 This then leads us to consider revising the course plan, which in turn leads us to the content of the next lesson. Earlier we defined learner autonomy as learners taking charge of their own learning and being responsible for decisions about their own learning. One of the points often made about learner autonomy is that learners do not always have the knowledge or experience, the “capacity” (Smith, 2008) to make such decisions effectively and that the role of the teacher is therefore to help develop awareness of the learning process and to make such decisions. Learner autonomy does not mean learners going off and doing it all by themselves – it means us recognising the different needs and wants of the learners and helping them to get where they want to go. David Petrie is a teacher with International House Coimbra, a teacher trainer with IH OTTI on the Business English Teaching and Certificate in Advanced Methodology courses, and a print and digital materials writer and consultant to ELT publishers. He is DELTA qualified and has a MA Applied Linguistics & TESOL. Professionally, his interests mainly lie in the area of teaching exam classes and ways of using technology in teaching. He blogs about this and everything else ELT related at www.teflgeek.net and can also be found on twitter as @teflgeek. Wall, D., & Horák, T. (2006). The impact of changes in the TOEFL examination on teaching and learning in Central and Eastern Europe: Phase 1, The baseline study. (TOEFL Monograph Series, MS – 34). I totally agree that exam students can become autonomous but some are more than others. My IELTS students who were missing classes regularly asked me to post my lessons online, so I created a blog. Now t here is a good body of work there and this has meant that the really motivated students can go and do extra work outside of class. It has made a huge difference to those who actually want to work. Two students last term went up two full band scores in 8 weeks and they said it was more the website than the classes that got them there. I'm not sure if this makes me a bad teacher or a good blogger.